Yet another dramatic night in the Libertadores for Paraguayan representatives saw Olimpia throw away a lead to incredibly miss out on qualification, something that seemed certain after beating Flamengo two weeks ago. Libertad were already through but managed to come from behind to win for the fourth time in this year’s competition and seal top spot. The Gumarelo are Paraguay’s lone flag bearers in the next round with Nacional already eliminated. 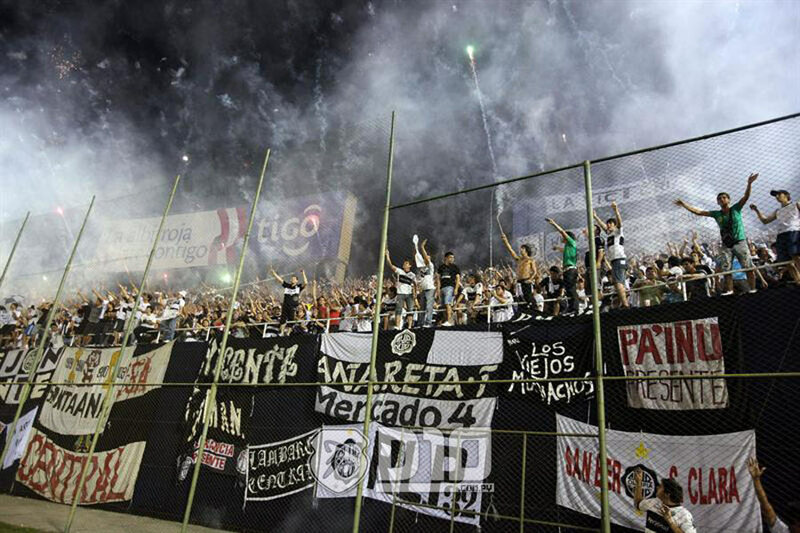 A huge crowd urged Olimpia on in their quest for a fourth Copa Libertadores title in the national stadium, Defensores del Chaco, and with both sides needing a win to progress it was an incredibly open first half. Sergio Orteman was bullying Emelec in midfield, surging past players and creating opportunities for the lively Arnaldo Castorino his first start in the Copa Libertadores. But Emelec threatened with the pace of Enner Valencia on the right and Paraguayan Fernando Gimenez on the left. It was the latter who had the best chance of the half midway through the first period, unmarked at the back post with Martin Silva having committed himself he was left with a simple tap-in but spooned over from a few yards out. The Ecuadorians were punished for that miss on the stroke of halftime, Pablo Zeballos led a counter attack from deep and played in Vladimir Marín, the Colombians shot was saved but fell to Castorino who made no mistake. The game continued at a frantic pace in the second half but there was no notion of the drama to come as Olimpia seemed to have control of the match, attacking well down the flanks but then they were rocked by a nasty clash between central defender Enrique Meza and goalkeeper Silva on 52 minutes. Meza, who had made two vital interceptions in the first half, had to be replaced immediately and Silva only lasted until the 65th minute when he was taken off for Victor Hugo Centurión playing only his third game for the club. Marcos Modaini equalised just a couple of minutes after that substitution, the Argentinian was the best player on the pitch and stooped to head into the corner from an almost impossible angle. Olimpia were shell-shocked and instead of seraching for an equaliser they were clinging on as the Guayaquil club sensed victory. They thought that victory had come in the 88th minute, substitute Marlon de Jesus bursting down the left side and pulling back for another replacement Angel Mena who had time and space to score. But there was plenty more drama to come. Five minutes of stoppage time was announced a result of the Silva/Meza incident and in the first of those minutes Olimpia equalised, a clever free kick routine saw Marín find Fabio Caballero well outside of the box his pinpoint pass turned in by Zeballos. Over in Rio de Janeiro the Flamengo players and fans rejoiced, a draw put them through! In fact they were still celebrating when two minutes later Emelec did the unthinkable, a corner from the left was whipped in by Mondaini and 26-year-old midfielder José Luis Quiñonez scored only his seventh goal for the club and his first in the Copa Libertadores. Emelec had secured qualification at the expense of Flamengo and Olimpia beating both of them 3-2 with last minute winners, for the Paraguayan champions it is back to the drawing board. This was not the plan. Libertad had already qualified going into this game but they wanted to secure topspot and did so with what is now a typical ‘come-from-behind-to-win’ routine. This is the fourth consecutive year the Guma have reached the last 16 as they shrugged off an indifferent league campaign to become the only Paraguayan club to progress to the knockout phase. Alianza took the lead it what was a dead rubber for them, a long ball from Edgar Gonzalez (ex-Olimpia and Cerro Porteño) found Paolo Hurtado who lifted the ball over Rodrigo Muñoz from a tight angle. But Libertad responded thanks to two goalkeeping errors from the hapless Colombian Jaime Rivera. A deflected Miguel Samudio freekick fell to left winger Nestor Camacho who let fly with a rasping drive that squirmed under Rivera on 53 minutes having just entered the fray as a substitute. With 15 minutes to go, Rivera’s tame clearance from a back pass fell invitingly to José Ariel Nuñez who scored with a low shot. Another victory from the jaws of defeat another knockout phase for Libertad, could this be their year? Such is the pull of Olimpia on big Copa nights that our outdoor viewing session was gatecrashed by two policemen who had cruised by and realised we would be watching the game. They enjoyed some chorizo and coca-cola during the 2nd half. I wanted to take a photo but wasn’t allowed! This entry was posted in Copa Libertadores 2012. Bookmark the permalink.